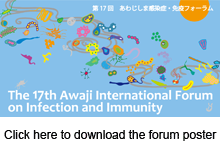 Next AIFII forum will be held from Sep 10 (Tue) to 13 (Fri), 2019. We have decided that we keep on our schedule in spited of bad weather. their presentation will be rescheduled. Welcome party will be held on the night of September 5. Extended the deadline for poster abstract submission (until July 23). Extended the deadline for poster abstract submission (until July 18). Extended deadline for Travel Bursary Application. Application for Travel Bursary has been started. Poster abstract submisson, Registration and Accommodation have been started. Grant-in-Aid for Scientific Research on Innovative Areas "Neo-virology"